Note: The Arca-Swiss Monoball B1 Ball Head has been replaced by the Arca-Swiss Z1 Ball Head. Note that the Arca-Swiss Monoball B1 Ball Head has been discontinued - you want to read the Arca-Swiss Monoball Z1 Ball head Review to learn about the improved replacement. For many years, the Arca-Swiss Monoball B1 Ball Head has been the standard by which all other ball heads are judged. Try one - you will quickly know why. Although not inexpensive, the Arca-Swiss Monoball B1 Ball Head delivers on quality. With the exception of a non-captive universal clamp thumbscrew (why not Arca?) - fit, finish and functionality of the B1 are exceptional. 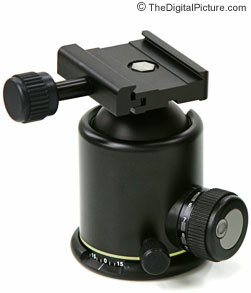 One of the Arca-Swiss Monoball B1 Ball Head's differentiators is that it is an aspherical ball head. As the load on the head is moved away from center, the effects of gravity increase. To offset the higher gravitational effect, tighter tension control is needed. Conventional ballheads require correcting tension control adjustments to be made. The Arca-Swiss Monoball B1 Ball Head, by virtue of its elliptical nature, automatically adjusts to handle the off-center load. The tension automatically gets tighter as you move the load off-center. And it works as advertised. Very nice. Tension adjustment on the Arca-Swiss Monoball B1 Ball Head is via a small thumb-dial on the main friction knob. I really like that it is easy to set but not easy to accidentally change - unlike the Kirk BH-1 Ballhead (below right) which utilizes a separate thumbscrew for tension adjustment. Another nice feature is the indexed friction control knob. This allows you to know how tight/loose your Arca-Swiss Monoball B1 Ball Head is without having to test it. The 360 degree panning base is also indexed (helpful for panoramic shots). 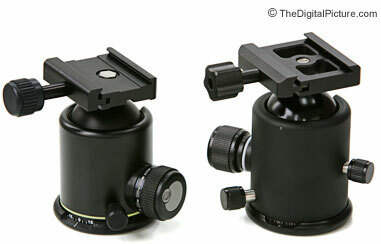 A universal clamp on the Arca-Swiss Monoball B1 Ball Head accepts universal quick-release body plates and lens plates. I like the more-round clamp thumbscrew design of the Arca-Swiss better than the Kirk BH-1 Ballhead's 5-pointed design. It is easier to roll/spin in your fingers. The Kirk likes more wrist action to be involved. 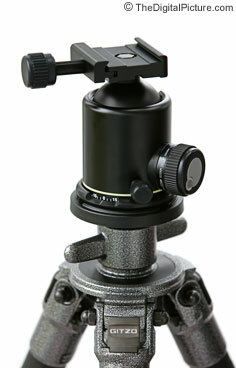 Pictured above is the Arca-Swiss Monoball B1 Ball Head mounted on a Gitzo G1327 Carbon Fiber Tripod. Is a 90 lb load rating high enough for you? If so, the Arca-Swiss Monoball B1 Ball Head will handle your equipment weight. I'm not sure I can imagine having 90 lbs mounted on this small 1.7 lb ballhead. Other than keeping it clean, the Arca-Swiss Monoball B1 Ball Head requires no maintenance. It is backed by a 3 year warranty. I keep it in a Lowepro Lens Case 1W when not mounted on a tripod. Overall, I am very pleased with the Arca-Swiss Monoball B1 Ball Head. It is a smooth, refined and solid camera support.